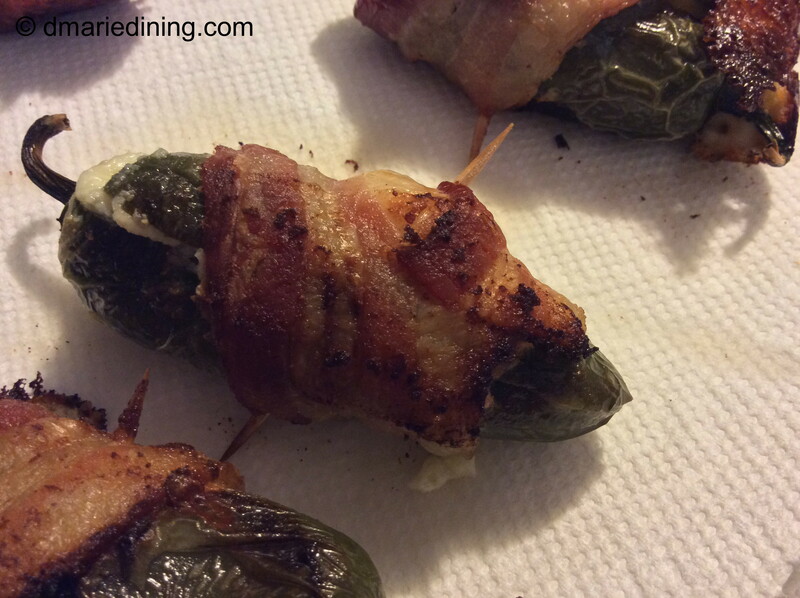 On a whim I thought I would try making Jalapeno Poppers. Not the type of poppers that are breaded and fried. 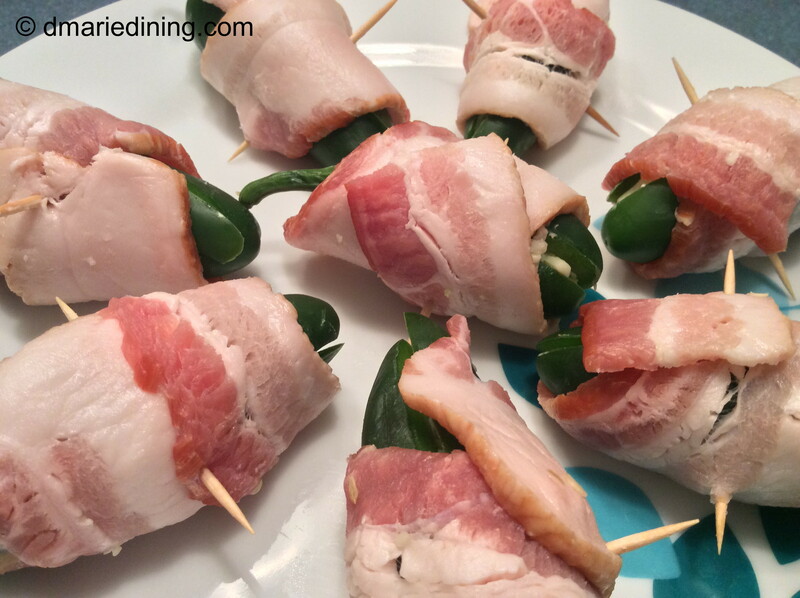 I wanted to make oven baked poppers with a twist. I wrapped them in bacon. Yummy! 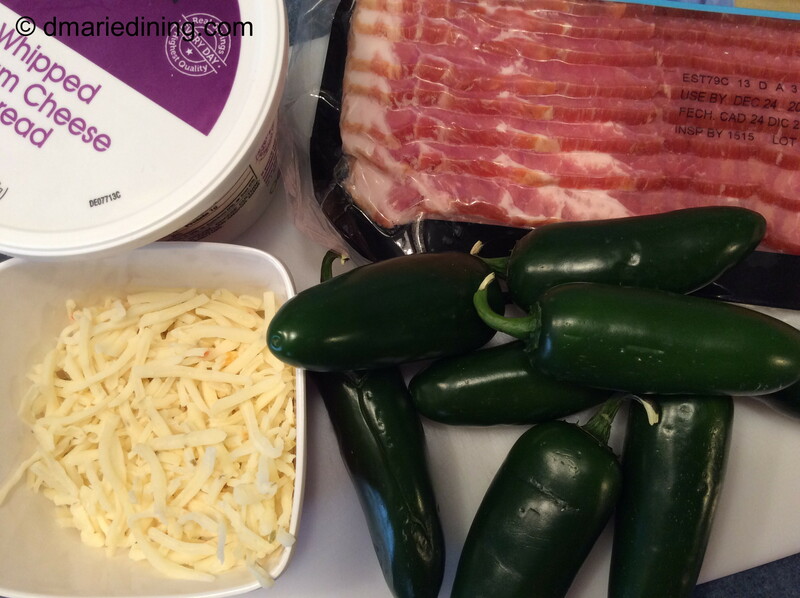 Making the Jalapeno Poppers with Bacon was a quick and semi-easy task. I was a little gun shy in making them at first because I had recently tried making roasted stuffed poblano peppers and it was a disaster. But, I made lemonade out of those lemons by adding the collapsed roasted poblano peppers to a brown rice dish I decided to create. More on that one later. The most difficult task in preparing the poppers was cleaning the jalapeno peppers. After slicing off a little piece of the pepper I had to remove the seeds and membrane. Both are the hottest part of the jalapeno pepper just like any other hot pepper. Removing the seeds and membrane helped to tone down the heat of Jalapeno Poppers but they were still a little hot. I guess stuffing the peppers with pepper jack cheese may have contributed to the level of heat also (ya think !?!). 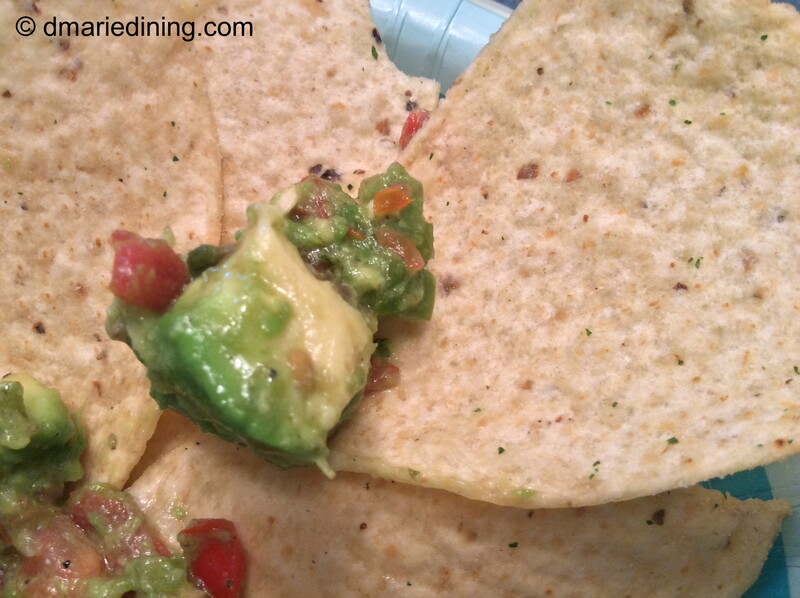 Of course, if you are not a fan of really hot foods, you could use a milder cheese like cheddar or monterey cheese. 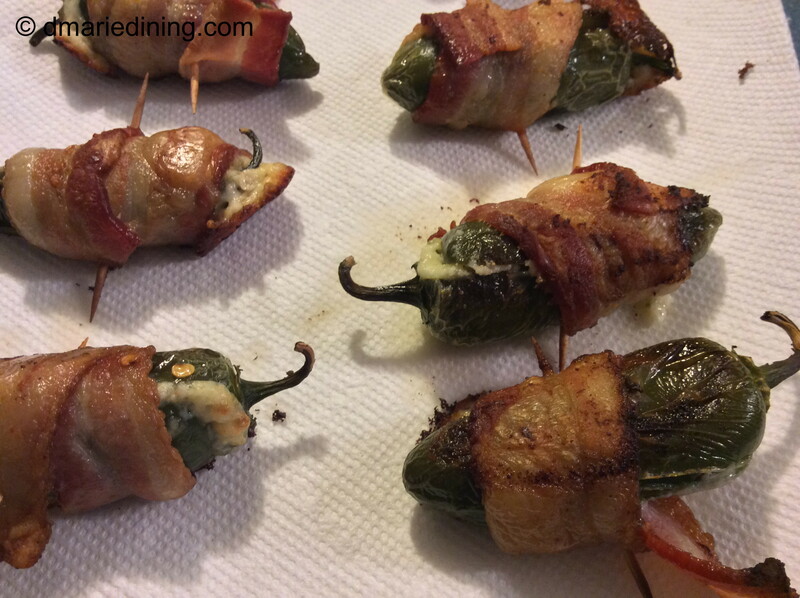 However, if you are willing to make Jalapeno Poppers I doubt heat is really an issue for you. Bacon. Who besides non meat eaters does not like bacon? 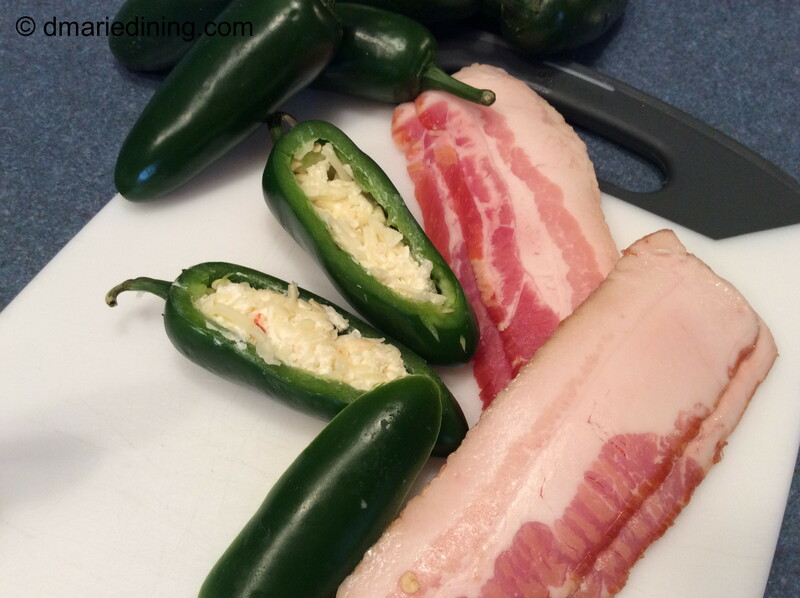 Bacon adds a lot of flavor to most dishes (even ice cream if you are truly adventurous) and it definitely adds another level of flavor to the Jalapeno Poppers. 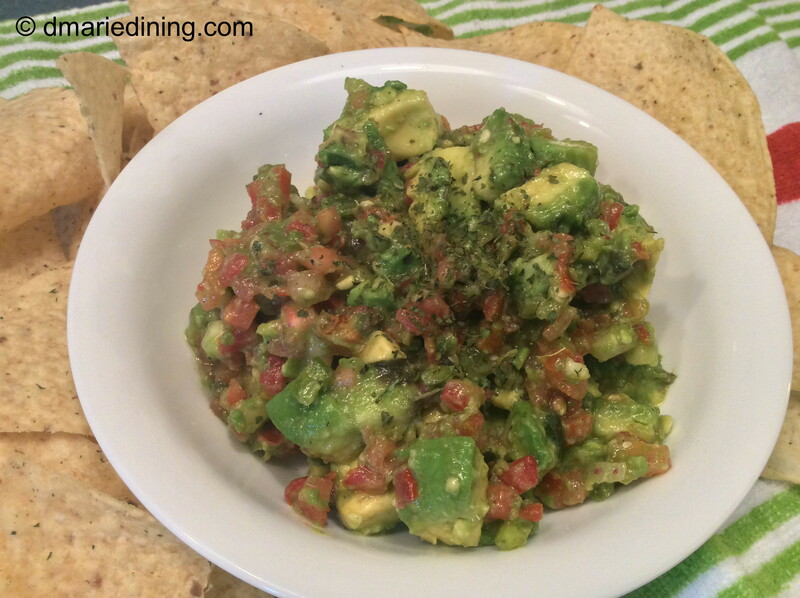 Fast, easy and tasty. Three words I like to hear whenever I have to cook. I think this recipe fits the bill for all three. Combine pepper jack cheese and cream cheese in a small bowl. Okay to use your fingers. Set aside. 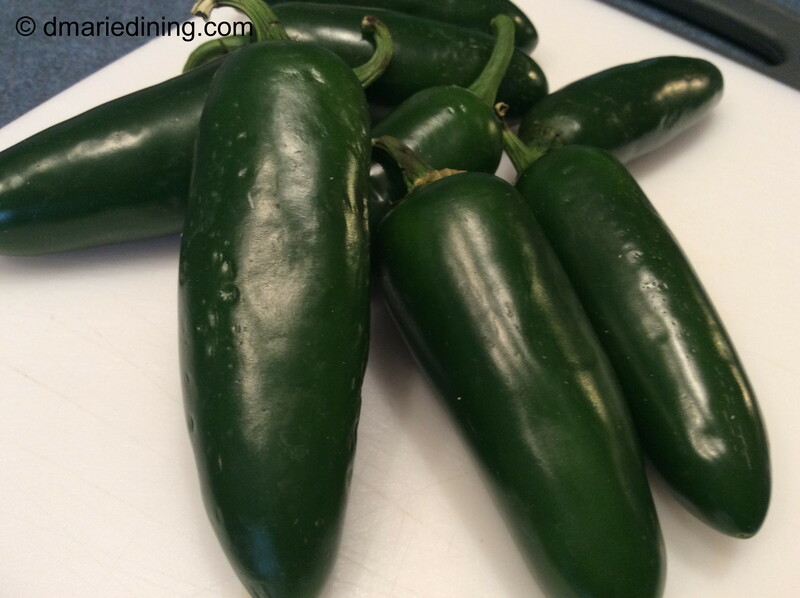 Slice jalapeno peppers lengthwise to remove part of the pepper without removing the stem. Prepare only a few at a time so that you do not mix up the different sections of the peppers. Stuff peppers with cheese then place cut slice over cheese. Wrap a slice of bacon and secure with a toothpick. Place on a rimmed baking sheet and back for 20 – 25 minutes until bacon is crispy. Drain on paper towels. To stretch the peppers just cut them in half and stuff each half then wrap in bacon. 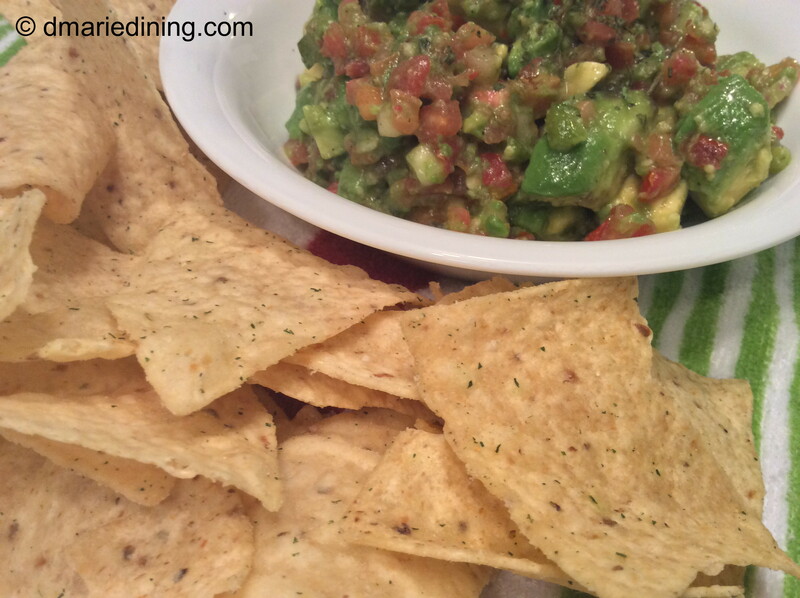 The peppers are great whether you serve them whole or in halves. 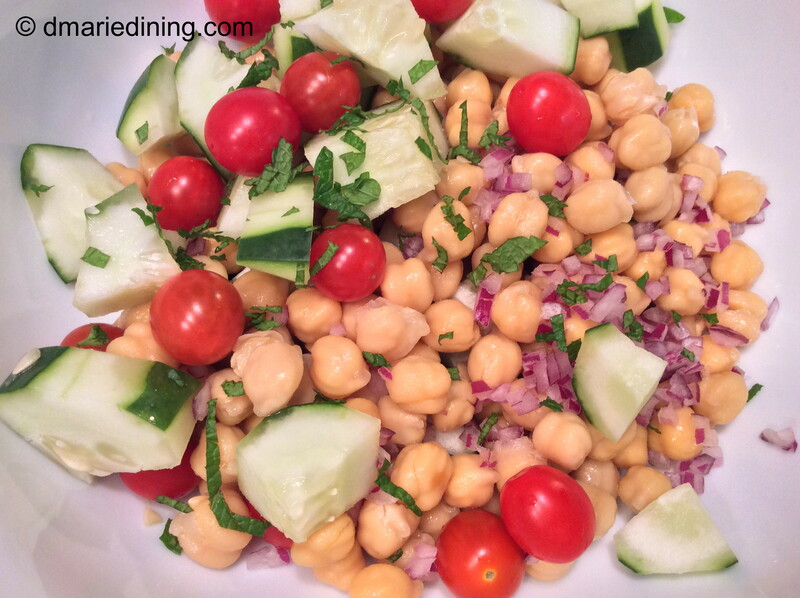 My friend Doll and I were discussing food the other day (as we usually do) and she told me about a great potato recipe she saw on the show “The Chew”. Since I am a potato lover my ears perked up when Doll said the recipe started with Yukon Gold Potatoes. 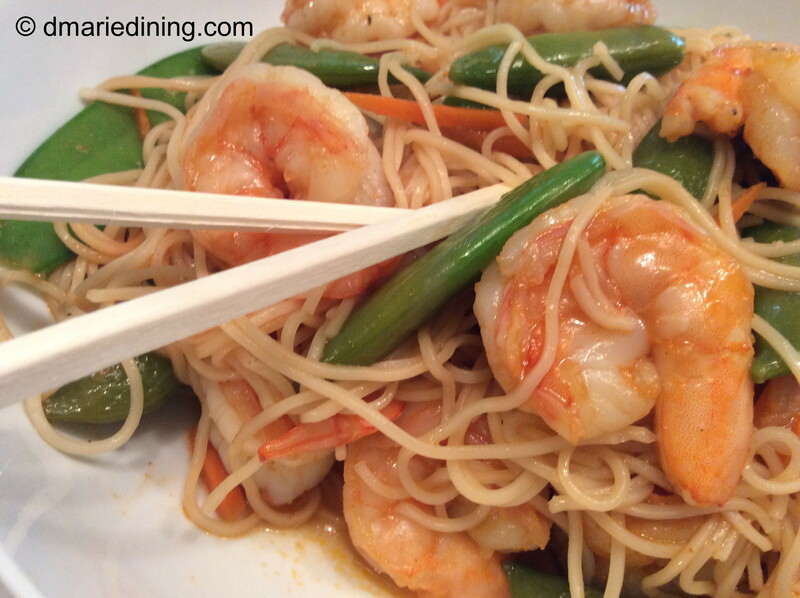 The recipe turned out to be simple so it was right up my alley. The most intriguing part of the recipe called for squishing the potatoes after boiling them until they were fork tender. Potatoes? Squishing? Sold! I knew this was recipe I wanted to make into my own. 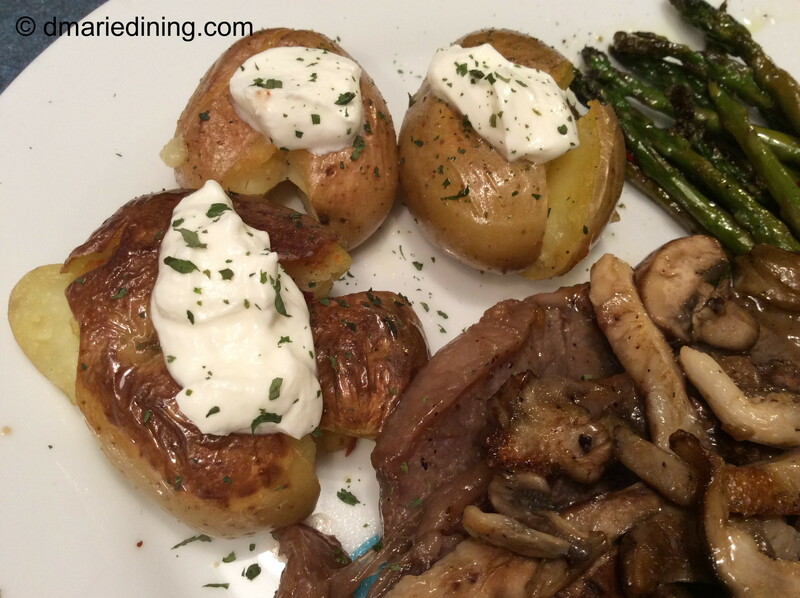 With just a few additions to the recipe Doll conveyed to me I created Potato Squishes. 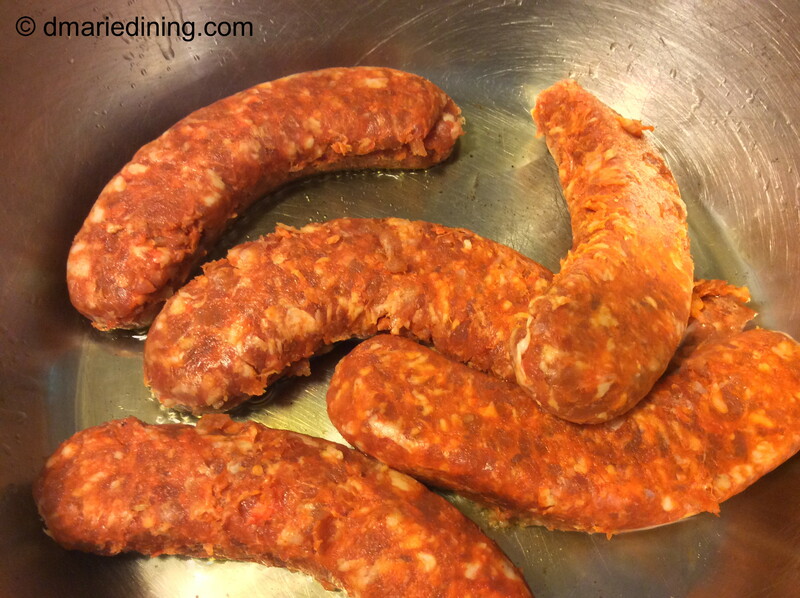 As I said earlier, this is a very simple recipe that will go great with any beef, pork fish or fowl entree. 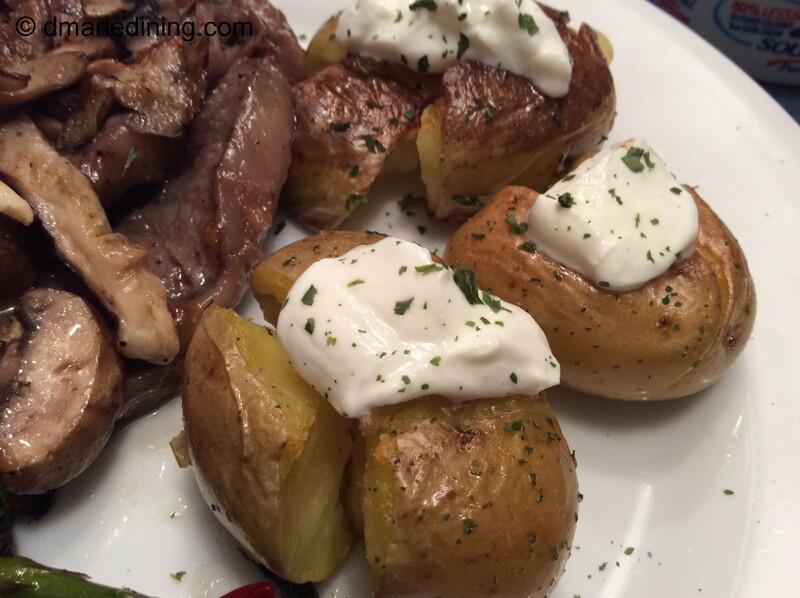 My first adventure into making Potato Squishes was to pair them with steak. Like my daughter often says “shut the front door”! What goes better with steak than potatoes? Nothing! My family was a bunch of happy campers when I served up a nice tender steak, salad and the newly created Potato Squishes. 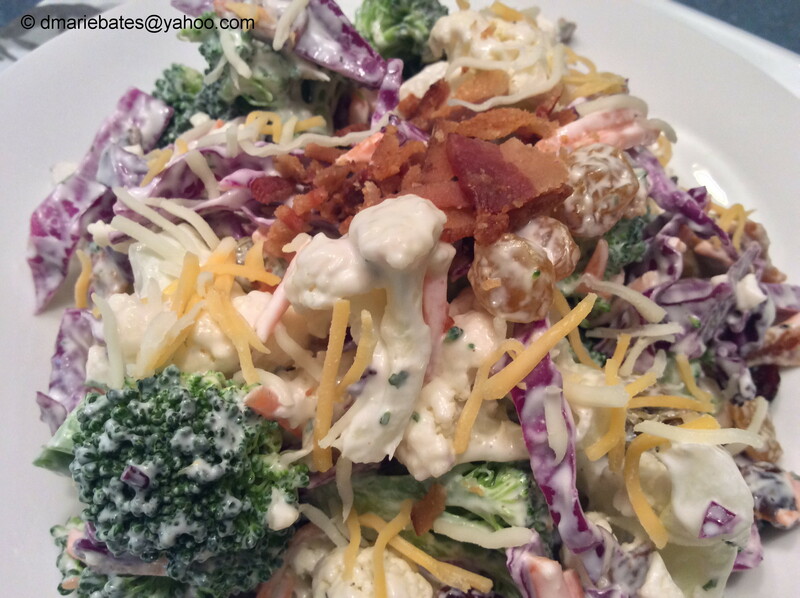 Doll – you are my new foodie hero. Thank you the idea and for sharing such wonderful recipes. 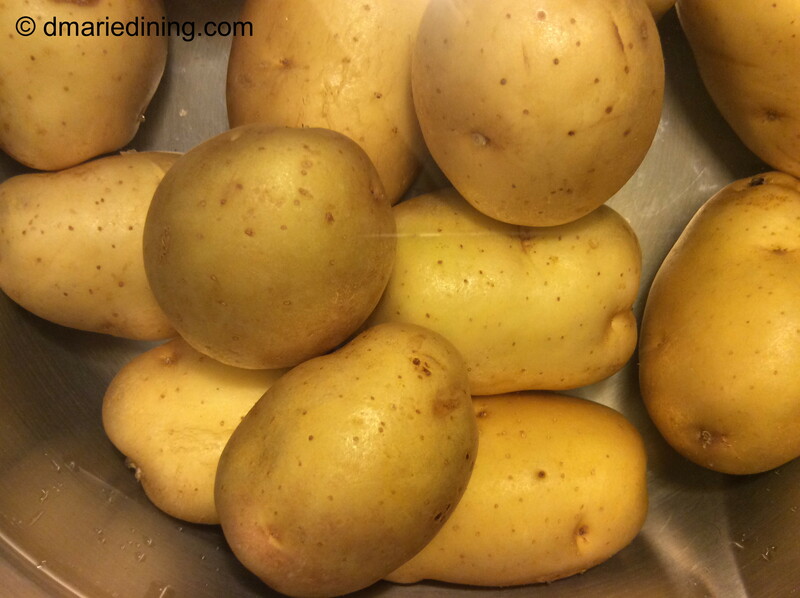 Place potatoes in a large pot with water and salt. Boil potatoes until they are fork tender but do not over cook. Remove potatoes from the pot and place on a flat surface. 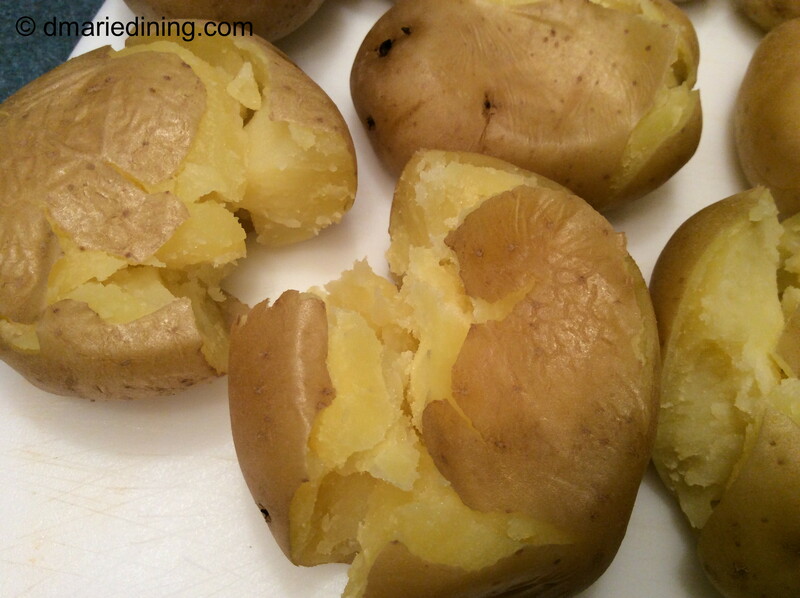 Gently squish the potatoes with the palm of your hand until they are slightly flattened. Heat olive oil in a medium size non-stick frying pan over medium high heat. Place potatoes in the frying pan and brown on one side. Flip the potatoes over and sprinkle with cheese. Lower heat to medium and cover until cheese melts. 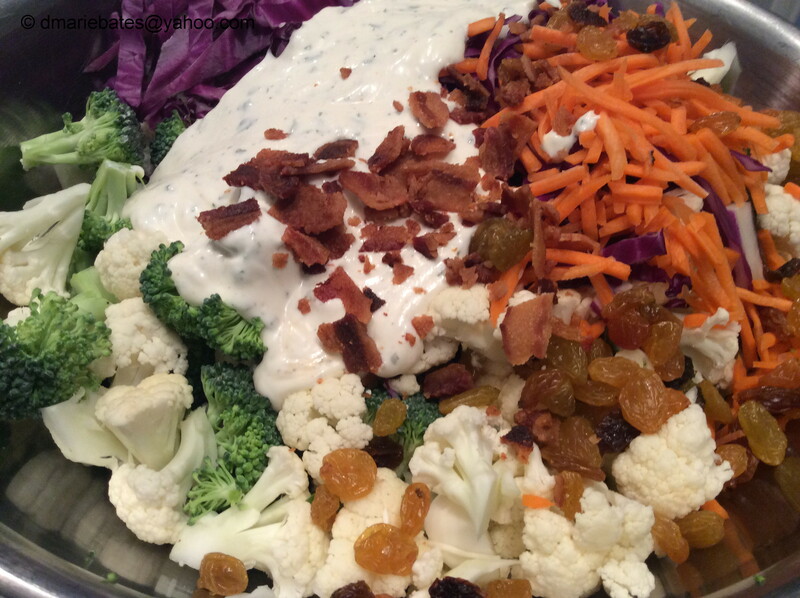 Place a dollop of cream cheese on top of the melted cheese then sprinkle with chives. 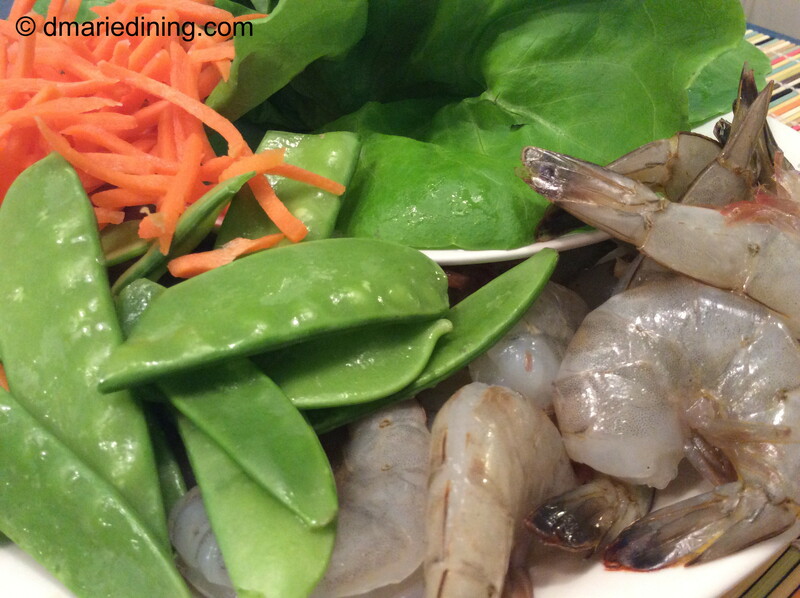 No matter what kind of greens you are preparing the key to making delicious greens is the seasoning. I don’t mean just salt and pepper. I mean down home kind of seasonings. Ham hocks, smoked turkey parts or fat back. Take your pick. 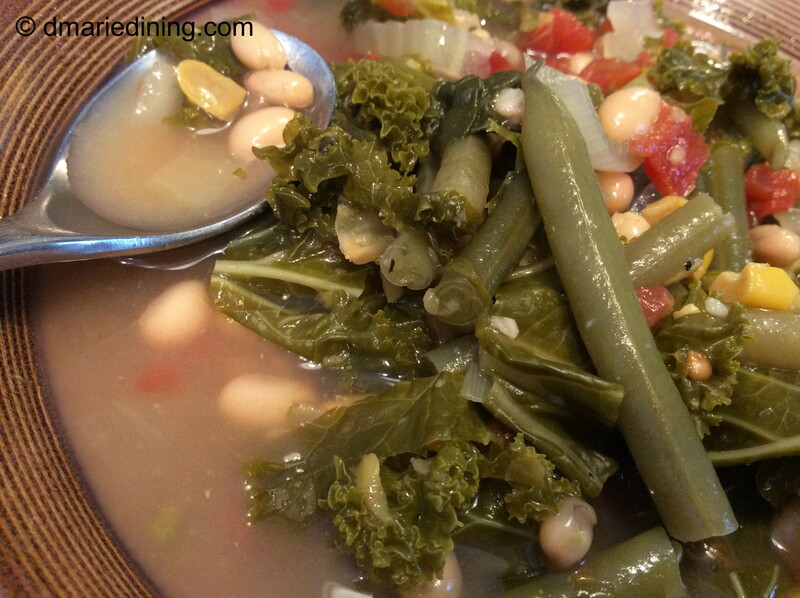 I have used them all at some point in time to season both my greens and different kinds of beans. 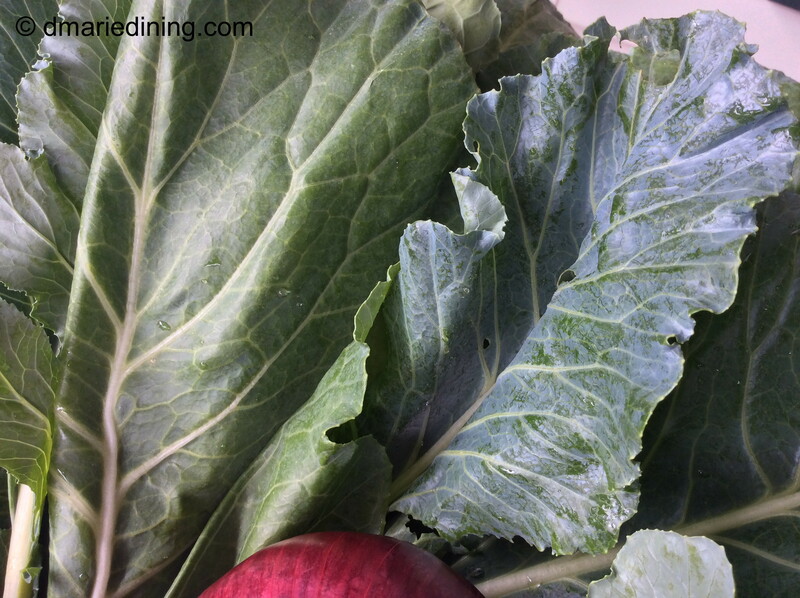 Collard greens, turnip greens, mustard greens and kale each have their own unique flavor. 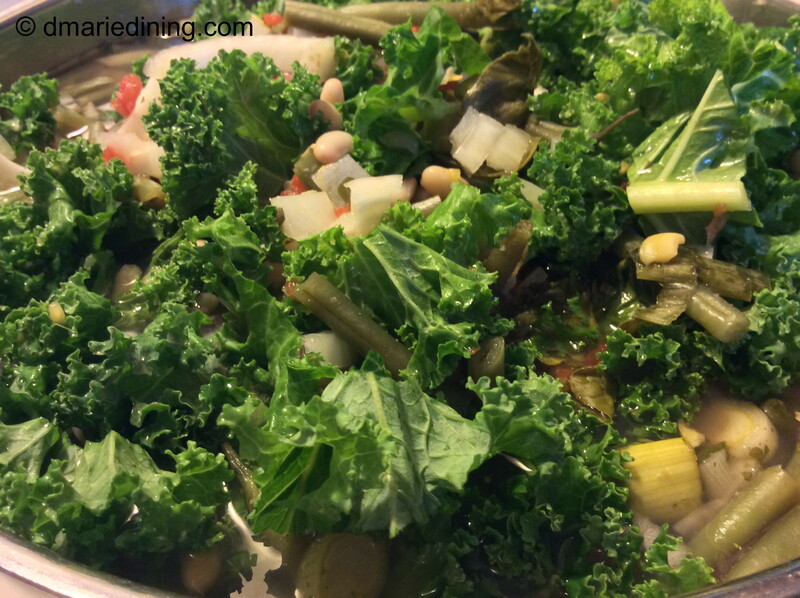 To me, kale has a very mild flavor that is sweeter than other types of greens. 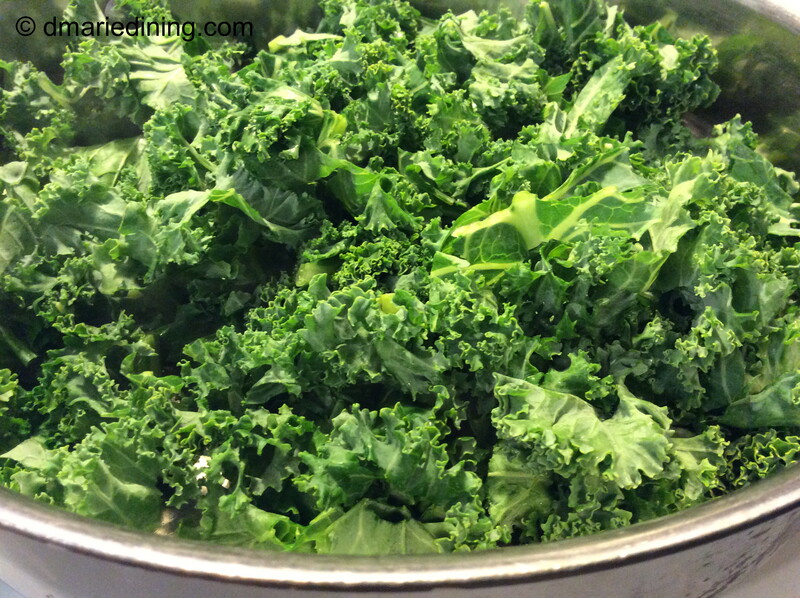 Plus, kale is a very tender green that has become popular as a substitute for salads or is prepared as a crispy snack. 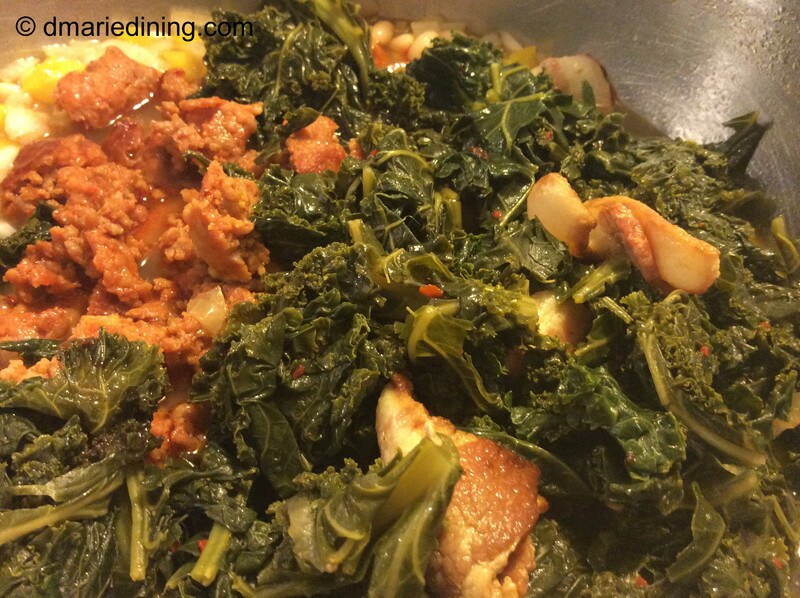 Turnip, mustard and collard greens on the other hand have a much stronger taste than kale. In the case of turnip and mustard greens I think they are on the bitter side so I often mix them with cabbage or with collard greens to balance the flavor. 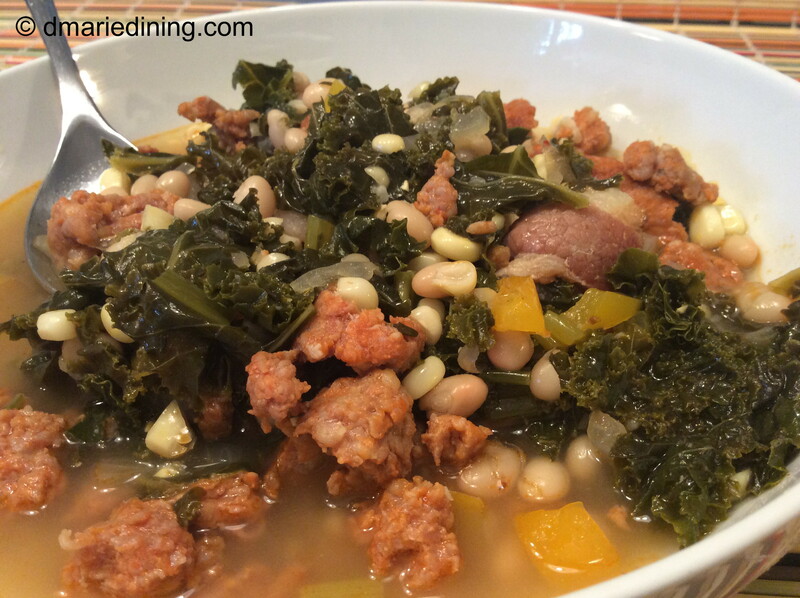 I love to pair collard greens with pork or if I am making a real southern Sunday dinner, I will make collard greens, fried chicken and macaroni and cheese. Throw in some skillet cornbread and my family is in heaven. Every year until he passed away my dad would plant a garden in the backyard and on one side of the house. He enjoyed planting tomatoes, peppers, okra, beans and collard greens. 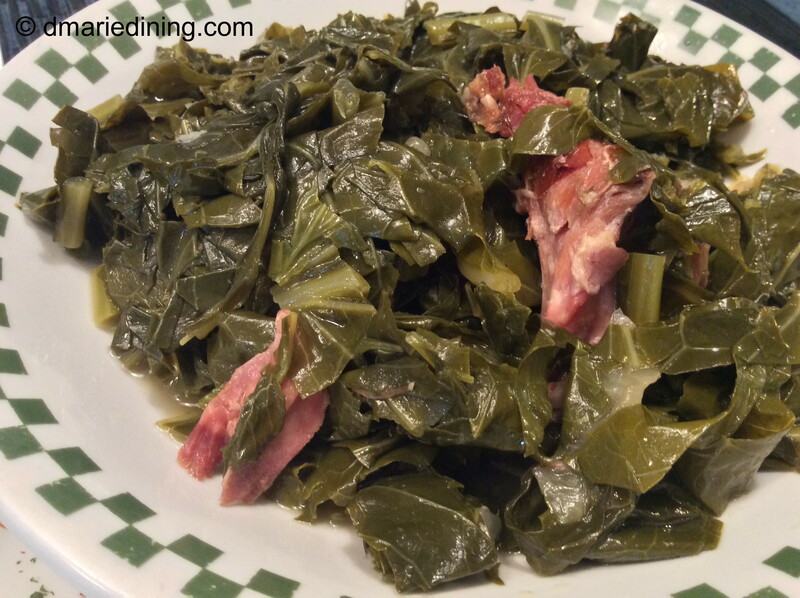 The collard greens were for my mom and me since he really did not like them but he would grow them just for us. I don’t know how he did it but each year he grew some of the prettiest collard greens I ever saw. I always envied the nice large leaves and when I bought my first house my dad gave me a couple of plants to try in my backyard. 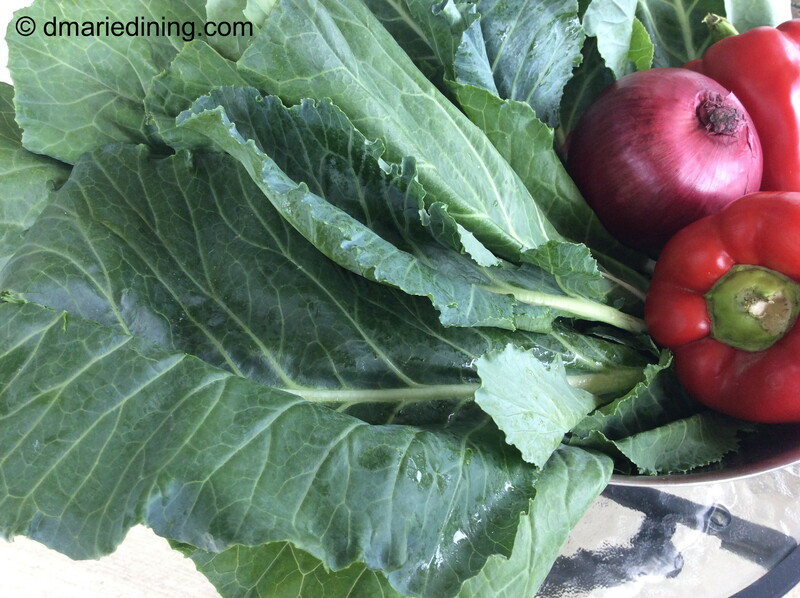 The collard greens never quite turned out like his and were often a little puny so I would go over to my parent’s house and pick a few from their garden to supplement my pot of greens. One trick my mom taught me when cooking Collard Greens was to strip the greens from the stem then layer a few into a pile. Next, you roll them up like a cigar and then slice them into ribbons. 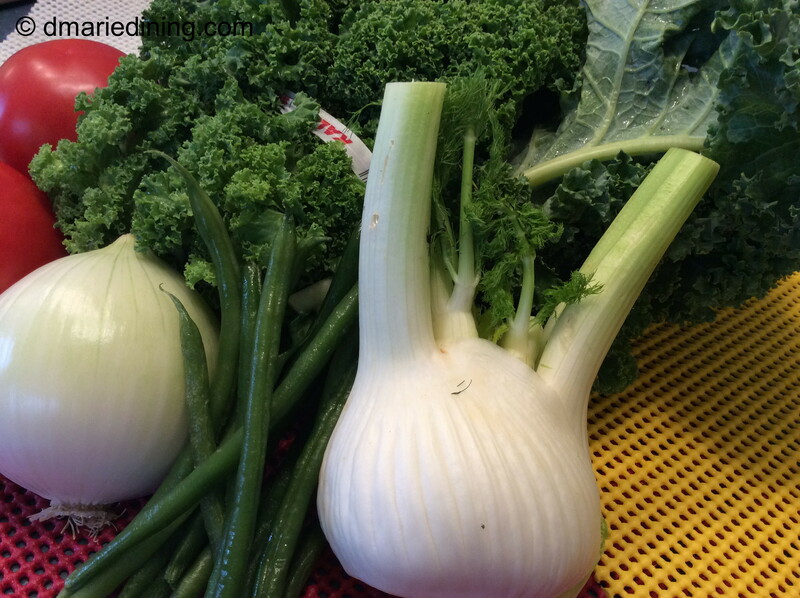 For whatever reason, my greens seem more tender when cut them up this way. 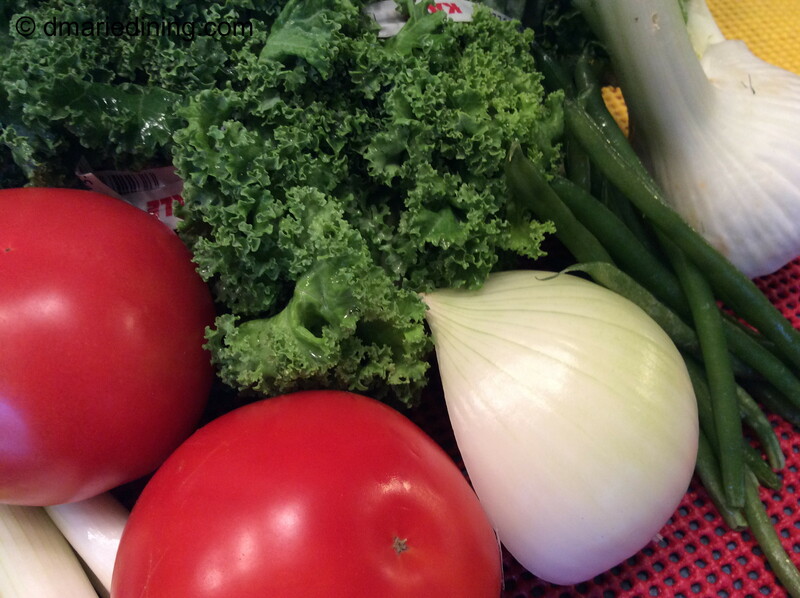 I also add a little sliced onion and my mom’s secret ingredient to my pot of greens. One or two (depending on how spicy you want the greens) hot peppers. 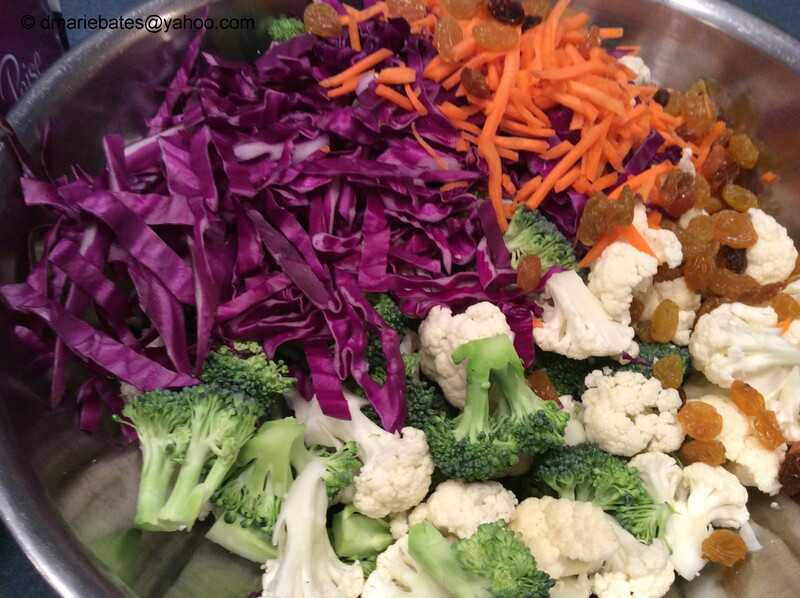 Do Not mix the peppers into the greens and break them up. 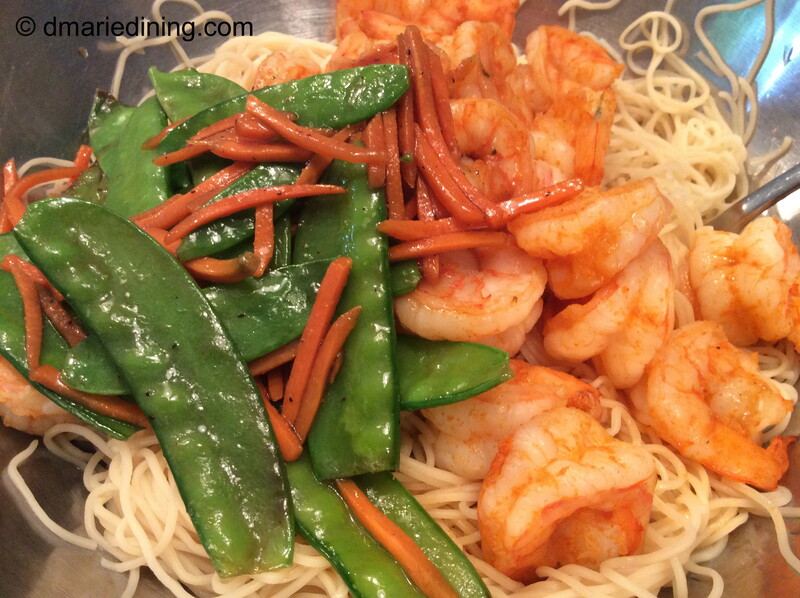 You also don’t want to lose the peppers in the greens when you stir them up . The person that finds the pepper will have a nice hot surprise. Back in the day I use to be that person whenever my mom forgot to take the pepper out. Now, it is my daughter that finds the pepper on the few occasions I forget to take it out. Remember to just lay the pepper on top of the greens and be careful when stirring them. Ummm …… talk about good southern cooking! Place ham hocks or smoked turkey legs into a pressure cooker with 4 cups of water with ½ cup of diced onion. Cook for 35 – 40 minutes. Cool down pressure cooker by running under cold water so that pressure is released. Remove meat. Drain broth and set aside. If you are not comfortable using a pressure cooker, place the ham hocks or smoked turkey legs in a large pot with 4 cups of water. Cook for 1 to 1 ½ hours on medium high heat until meat is tender. Remove meat and drain broth. 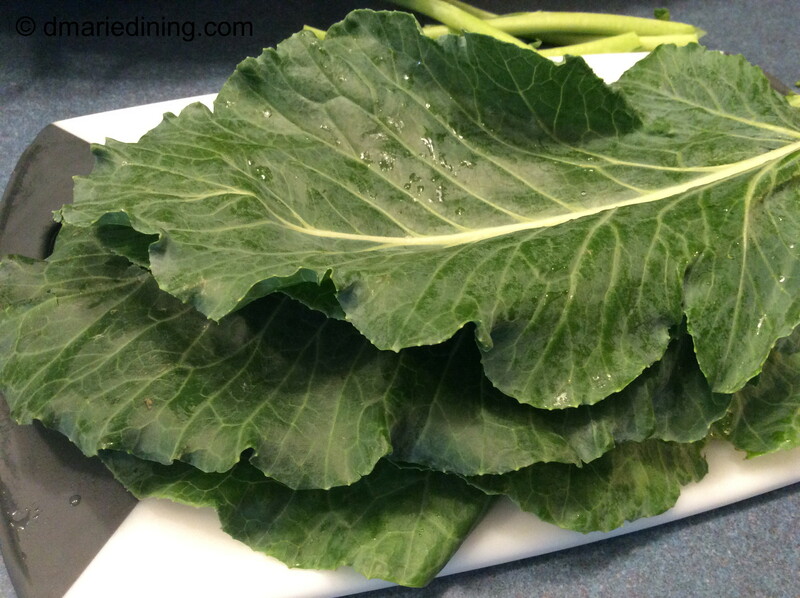 Remove stems from collard greens. 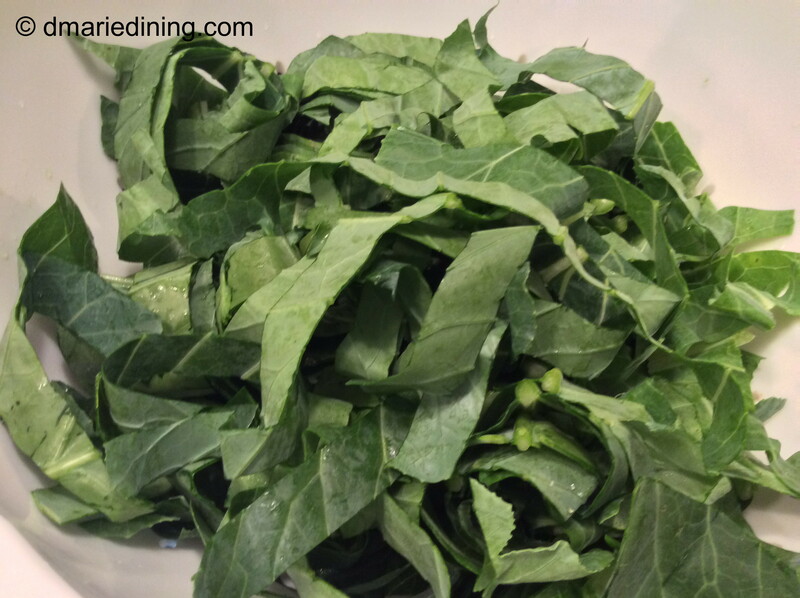 Layer collards in a stack of 4 – 5 leaves then roll up like a cigar. 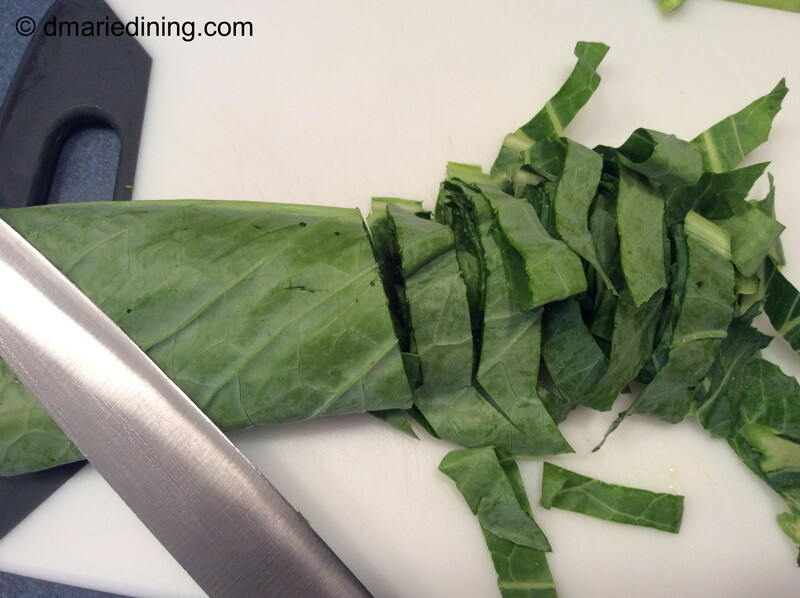 Slice collard greens into ribbons. Set aside. Heat bacon fat in a large pot over medium high heat. Add onions and saute for 1 minute. 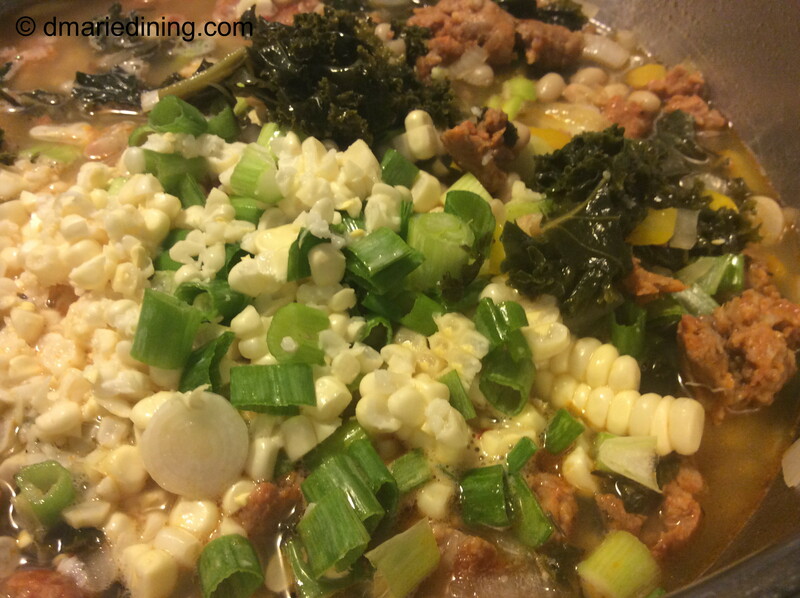 Add meat, broth, water and collard greens to the pot then sprinkle with seasonings. Lay hot pepper on top of the greens. 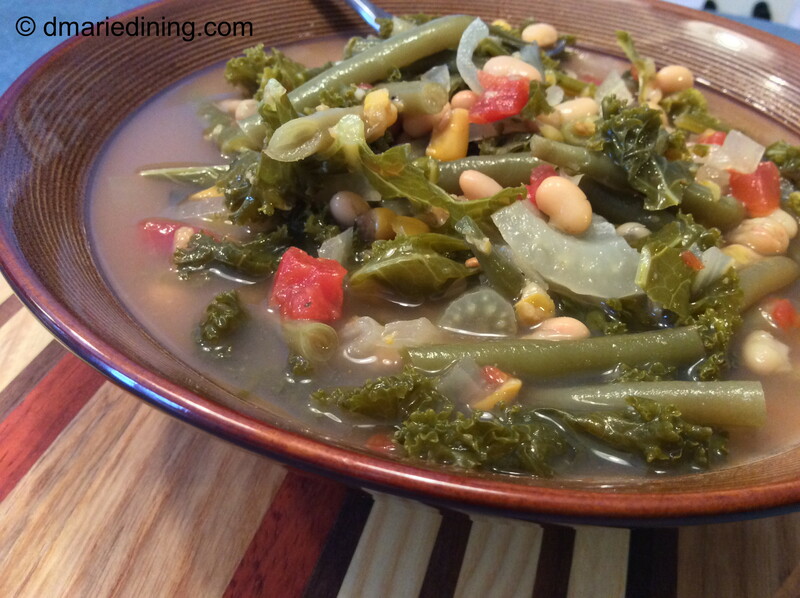 Reduce heat to medium and let greens cook for 1 ½ hours until they are tender. Stir occasionally but be careful not to break up the hot pepper. Add more water if necessary. 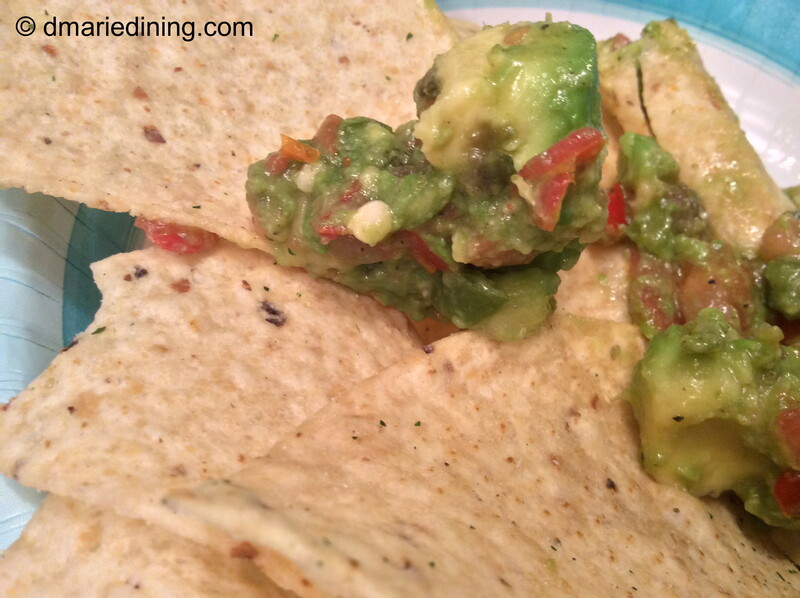 Remove the hot pepper prior to serving. Summer is slowly fading which means all the delicious backyard veggies, fresh corn and fresh herbs I grew will also fade away. 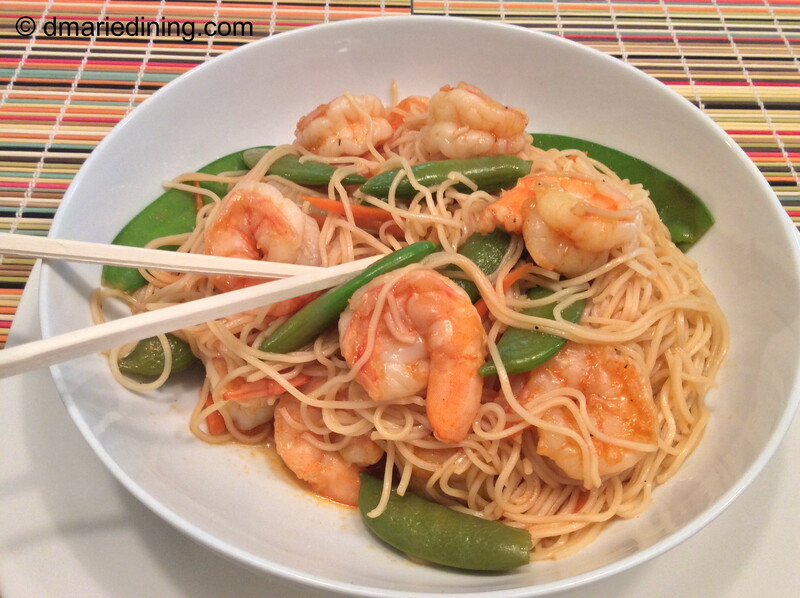 Before fall settles in I thought I would come up with a dish that we could have year round but would remind me of our hot and lazy summer days. 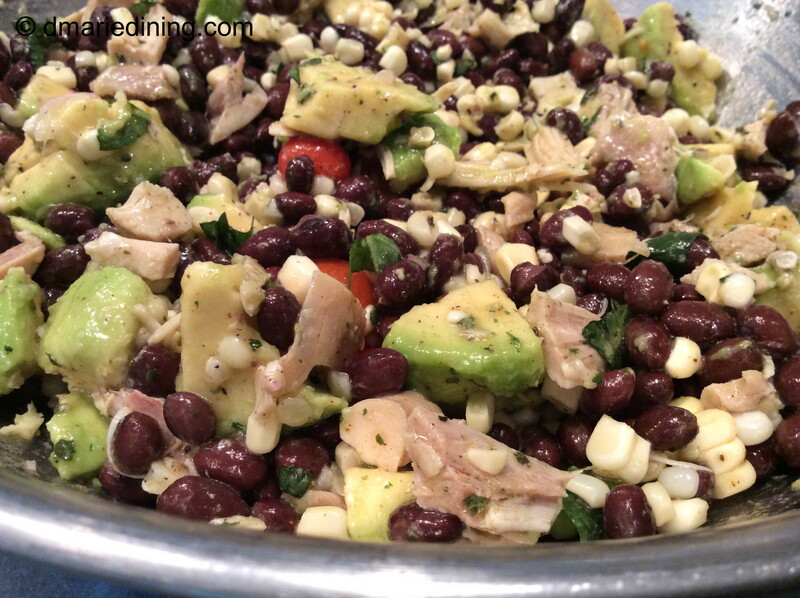 Tex Mex Chicken Salad became my summer reminder. 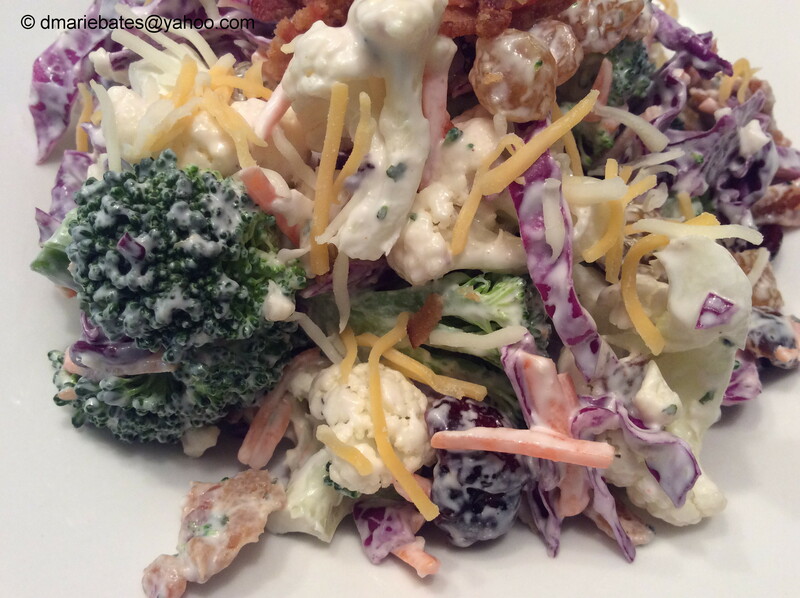 Chicken salad was one of my favorite meals growing up. My mom made some of the best chicken salad around and always made little blueberry muffins to go with the salad. 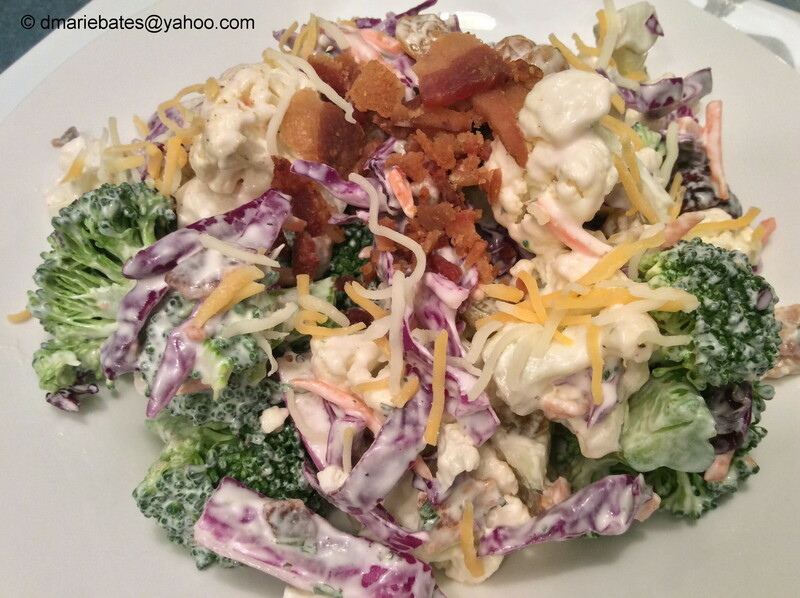 It took me a while but I mastered make my own wonderful version of chicken salad. 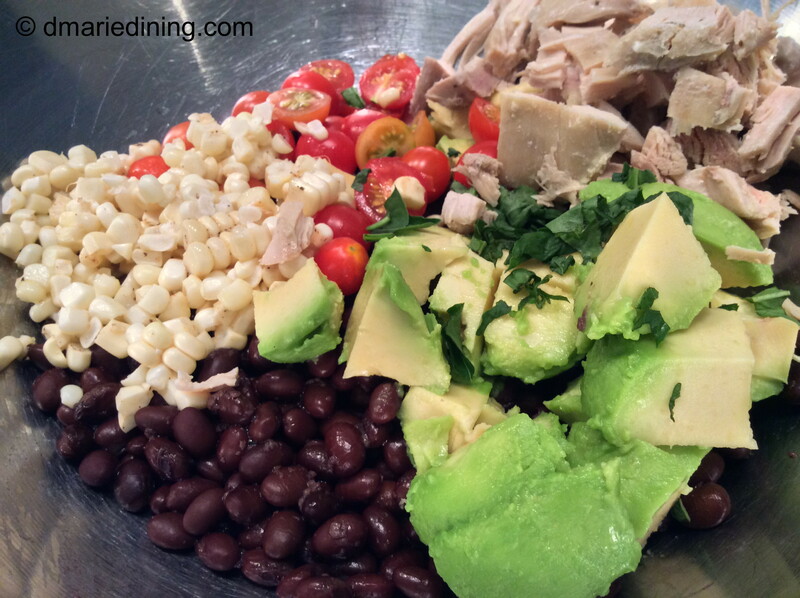 Because chicken is so versatile it can be combined with a lot of different ingredients to make a fantastic salad. 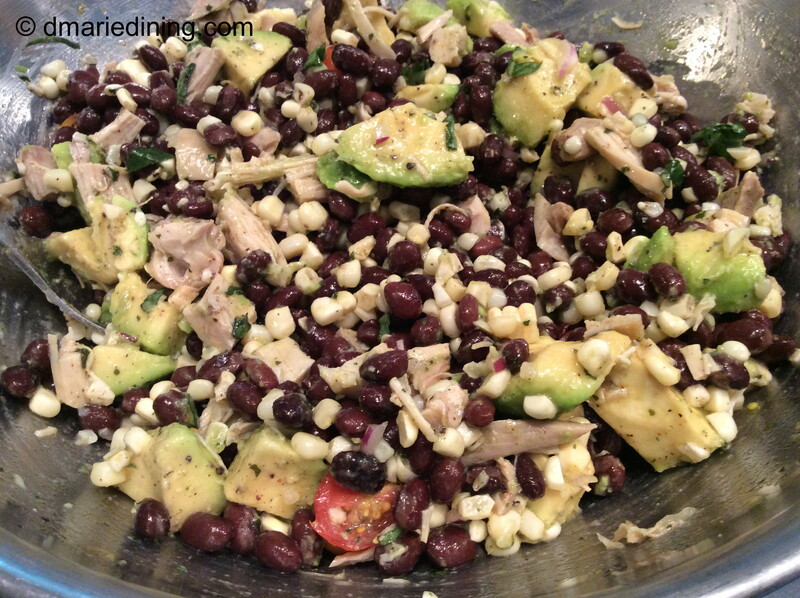 Tex Mex Chicken Salad combines black beans, corn (the reason I call it Tex Mex) and avocado along with fresh herbs. 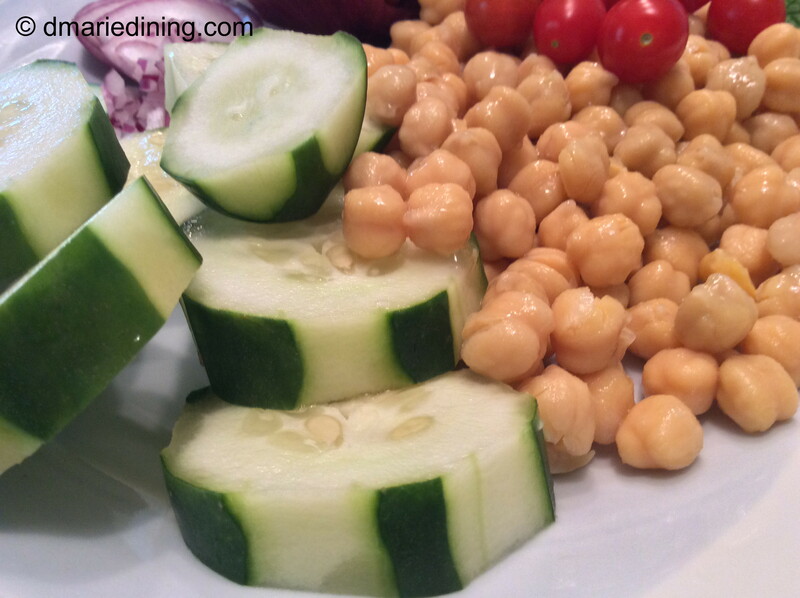 Lemon and lime juice help brighten the flavors. As always, my family likes heat so I add a little cayenne or chopped jalapeno peppers to spice up the salad. 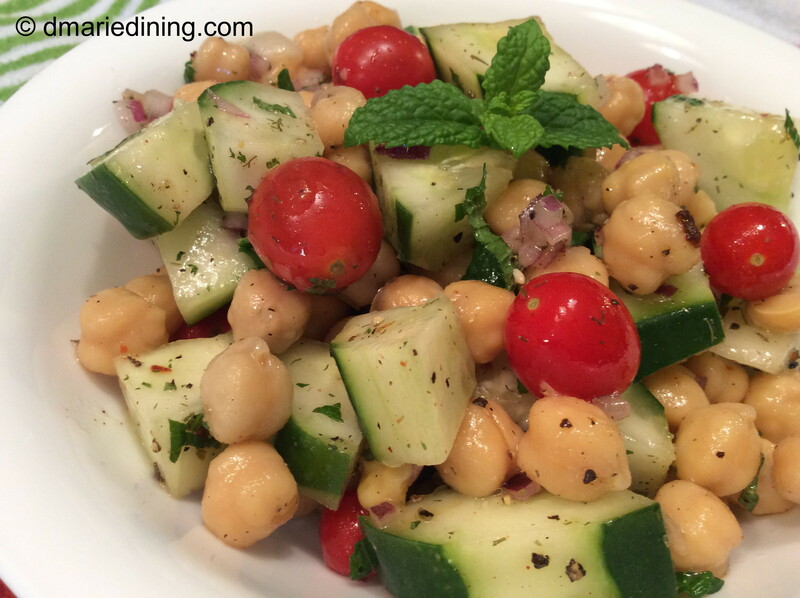 Even though summer will fade into fall it doesn’t mean we cannot continue to enjoy the great tastes of summer. Remember, all it takes is a little chicken, a few fresh veggies and memories of those hot, lazy days we enjoyed so much. 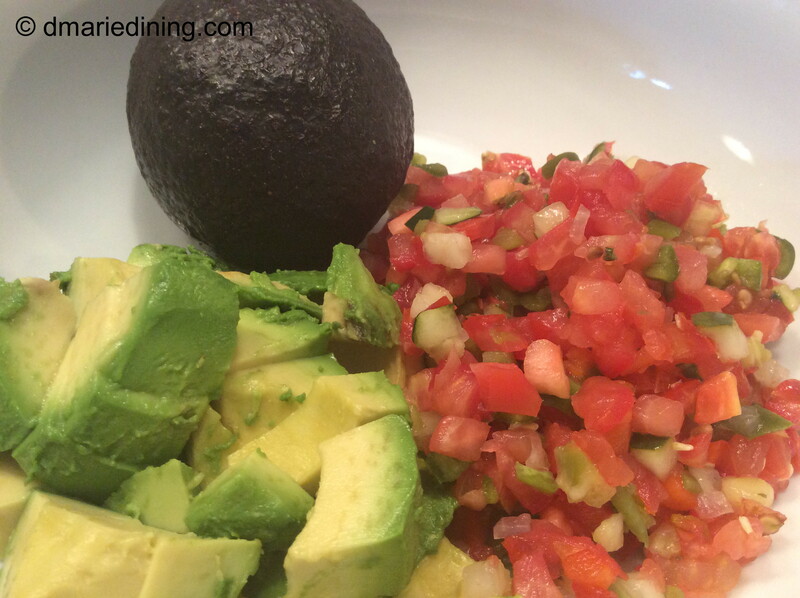 Place olive oil, lemon juice, lime juice, cayenne, parsley and cilantro in a small bowl. Whisk together. 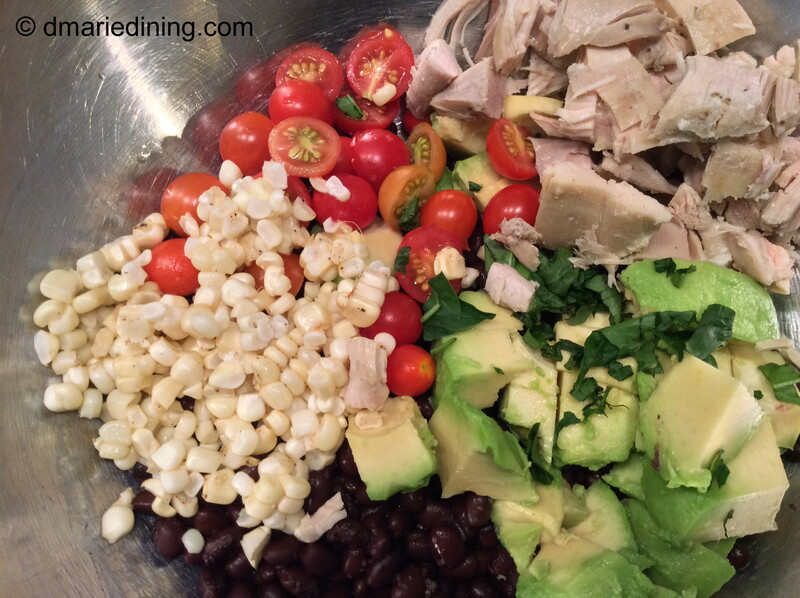 In a large bowl add chicken, corn, avocado, tomatoes, red onion, salt, pepper, chili powder and basil. 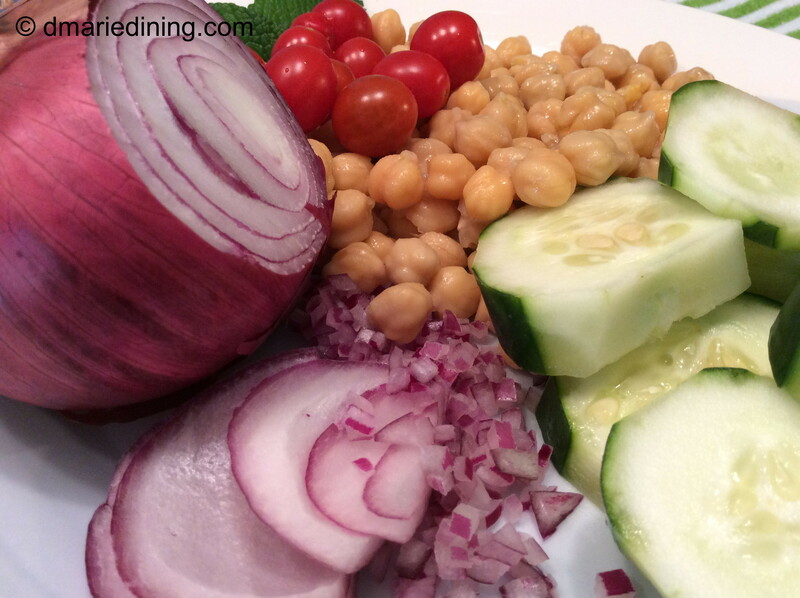 Pour dressing over salad and gently toss.